Thanks to contributor Obi-Wandi, here is an early look at Championship Wrestling on the C64. This early screenshot was found by Obi-Wandi whilst looking through issues of Happy Computer magazine. It may well just be a mockup, but it could be interesting to see if an earlier version does exist with more detailed graphics overall. Maybe the characters were just removed to put in more details for name and score? This entry was posted in GTW64 news, Prototype. Bookmark the permalink. I’d love for these to be real screens, but sadly the 8 Bit scene has seen far too many mock-up screens passed off in the press (ZX Spectrum Toki and Nemesis, C64 Operation Thunderbolt, A8/C64 Polar Pierre etc etc), that i remain very wary. 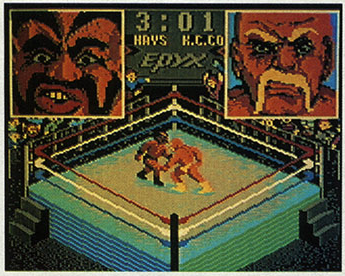 Also note the stairs for each of the wrestlers, which suggests that Epyx had originally intended to include animated introductions of each fighter entering the ring. Memory restrictions may have been the reason why the stairs were scrapped but also the redundancy of yet another non-playable bit coming right after the great animated faces of the wrestlers taunting each other could have prevented possibly very funny animations from appearing in the shipped product. The idea that the stairs might point to long lost assets makes one crave for the development disks. ah – I remember seeing the actual game and then thinking it looked different to early magazine shots – as if it was a different computer!